Since I have been spending stupid amounts of money on new house stuff, there’s not a lot of new blades flowing in to the hizzouse O spizziderz presently. So here are some closeup shots of the United LOTR pieces to keep the site from total stagnation! The elvish lettering on Sting is OK but a bit perforated looking. Runes on Anduril are slightly smoother than sting. Also, I’d like to point out that I updated my Links (recommended) section to include more excellent Spydie collection sites. Check ’em out! My only United purchase, evar. It was an ebay weakness. Yes, I am a fan. Yes, I had to have them all. Yes, it was fairly cheap. 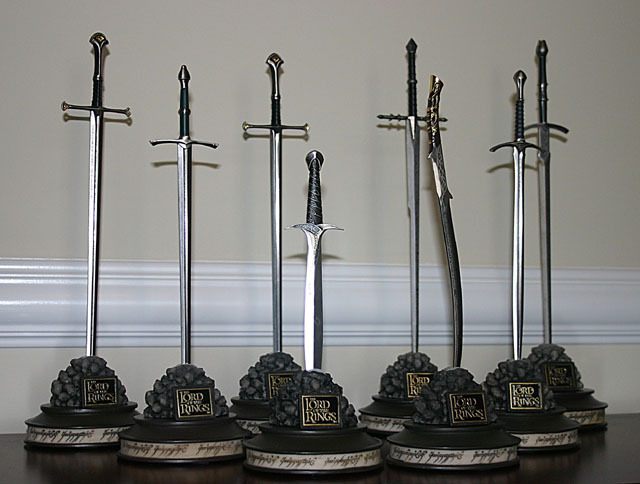 Anduril, Strider’s Sword, Narsil, Sting, RingWraith, Hadhafang, Glamdring, Witch King. To be fair to United, these were better crafted than I anticipated. Score!